New Delhi: Union minister Smriti Irani and Congress spokesman Abhishek Singhvi fought on Twitter today after the latter suggested that India climbing up the ease of doing business ladder was "fixed". "Easy to hire consultants and 'fix' #EaseOfDoingBuisness rankings. It's hard to undo the real damage done to Indian economy by Messrs Modi&Co," Mr Singhvi tweeted. Hitting back, Ms Irani Twitted: "Callous remarks on World Bank rankings compels one to ask whether policy paralysis of 2004 - 2014 UPA Government was also fixed?" 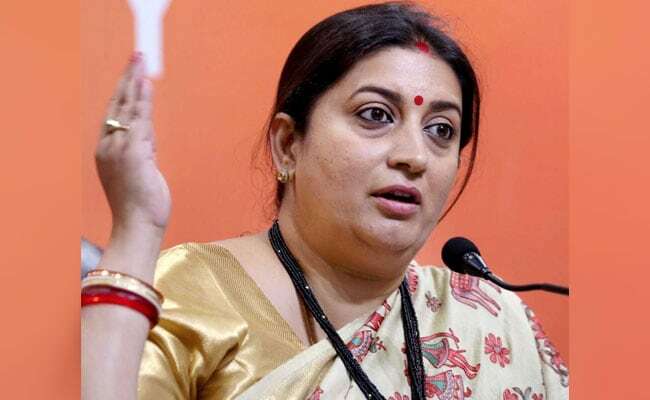 In another tweet, Ms Irani, the Information and Broadcasting Minister, said, "Regrettable that party which ruled India for 5 decades seeks to intentionally manufacture controversy & play with sentiments of the Nation." She was responding to Mr Singhvi's tweet which said, "#EaseOfDoingBuisness at best a signalling factor. If your basics are fundamentally weak, no amount of marketing hype can fix 'lived reality'." According to the World Bank report released yesterday, India's rank on the 'ease of doing business' scale has risen from 130 to 100 this year, helped by a slew of reforms in taxation, licensing, investor protection and bankruptcy resolution.